So it’s Friday evening and every soul on Earth wants to have a good time. And Medvedik is not an exception. Earlier that evening, he got an invitation from his friends to go see their new apartment. They asked to bring the drinks along. «That sounds good!», thought little Medvedik, while packing a bottle of tomato juice. Arriving to his friends’ place, he spotted a cat at the entrance and went to play with him. The cat was so cute that Medvedik wanted to invite him to come see his friends’ place too, but then he remembered that one of them had an allergy to cats. Medvedik said good-bye to the cat and promised to write him on Facebook tomorrow morning. Medvedik’s friends were surprised to see tomato juice as the drink for the night, so they brought up the idea to go to the bar called Rock Bottom. Medvedik was uneasy about going to the bar, because he could not understand at first how could you go to a relatively long, straight, rigid piece of solid material called Rock Bottom. But then his friends explained that it was a place, not a piece of material. At the entrance to the bar there was quite an unstable crowd, which was probably too tired after their working day, thought Medvedik. One guy even had problems entering the door, although it was wide enough. A big security guy stamped Medvedik’s back at the entrance, and the little polar bear was taken in the kingdom of the loud music and lickerish people. A girl in a very short dress tried to catch Medvedik’s glimpse and take him to the dance floor with her, but he preferred to stay aside. His friend offered Medvedik a weird-looking blue drink, which tasted sweet and lovely, but Medvedik remembered his fiesta in Sweden and decided to stay away from alcohol this night. He ran around couple of times before landing at the table with peanuts. The bar was fun, but Medvedik felt dizzy because of too much smoke around him and the music, which was way too loud. With a heavy head but a light heart, he rushed outside to drown into the hot night air of Dubai. He looked up in hope to see the stars, sighed, and went home, thinking about the endless starry night on the North Pole. 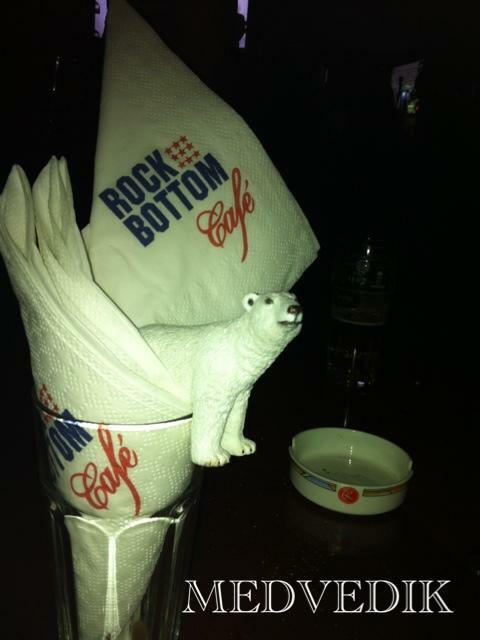 This entry was posted in Flair for Fun and tagged Bar, dubai, Friday night, friends, medvedik, polar bear, rock bottom, tecom. Bookmark the permalink.